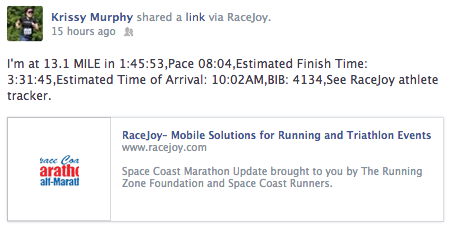 Recap: Space Coast Marathon 2013. Didn’t BQ today, but I feel really good about what I did do – ran a great pace until hitting the Mile 25 wall. Enjoyed the course! It was great seeing familiar faces for high-5s (and a hug, after hitting the wall, thanks Michael) LOVED the first half (beautiful homes, wonderful rolling hills) and appreciated the size and flow of the race. Did NOT love the shuttles, though I was glad the issues I had with them after the race were, in fact, after the race and not before. My new look, the painface smile. And now, a bit of a recap…. I had set the alarm for 3:45 AM, so I could catch the second wave of shuttles to the race start at 5. I stayed at the Radisson Resort at the Port, which, albeit a bit dated, was a nice enough place, as well as a host resort. As often the case, however, I woke up before the alarm (3:30) and after seeing that others were experiencing issues with the busses (via twitter/FB) I decided to head down early (4:30) and jumped right onto a shuttle with out about 5 people on it. I met some nice people and chatted a bit, including a fellow runner from Sarasota, so that was nice. Once we arrived at Cocoa Village, I walked around a bit before running into the Pacebook Running Group peeps and hung out with Ashley (was so pumped for her first marathon)!!! Before long, we jumped into a porta potty line and after the half marathoners cleared for their start (6 AM) we made our way over for ours (6:30 AM). It felt kind of cool out (it was in the 60s but there was wind coming off the river) and I was glad that I decided to wear throw away sweatpants to the start. The ‘opening’ to the race was pretty funny…the PA system was not the greatest so during the anthem, it kept cutting out. Funny enough, everyone was singing along, so it was kind of amusing. Five minutes before the ‘lift off’ I removed my sweats and threw them on the side of the road in a already forming pile of clothing. I loved the start…there is a big monitor and it does the space shuttle countdown! We set off North, out of town and onto our first out and back. I can really lump all of these together because I loved each one so much. It was dark for the first few miles, but I executed my race plan just as I wanted to: slow first mile (8:19) and subsequent miles around the 8 min range so I could achieve a 1:45ish first half – and I came in right under 1:46 according to splits. So, yes. 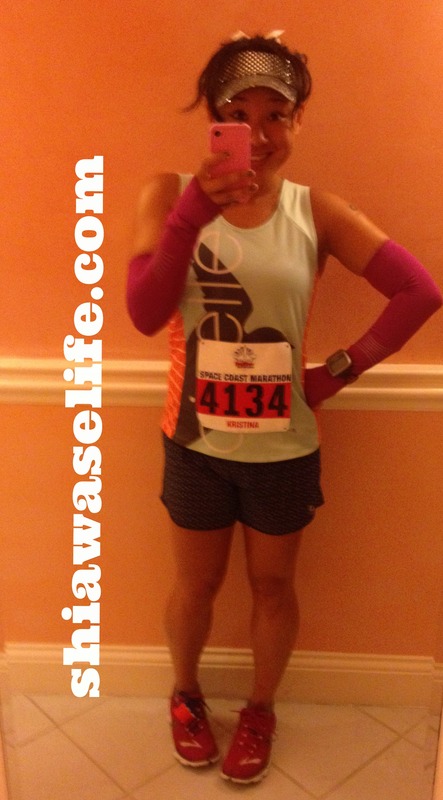 I had trained for a 3:30 marathon, since my qualifying time is 3:35. I LOVED THE FIRST HALF – not only because I was on pace, and there were nice rolling hills, but because after the turnaround before Mile 7, I saw so many friends on the course and it pumped me up. So, I felt great. 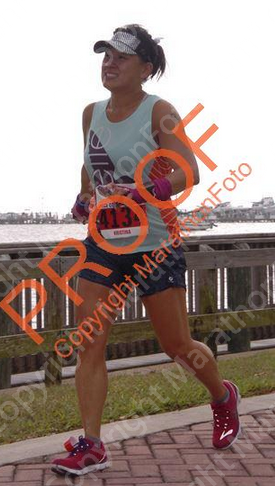 I took my GU at miles 6 and 12 – and due to the humidity, I took gatorade at every water stop. After that first half, it was onto the second out and back. Pretty uneventful. Miles were not as consistent as the first half, but not awful either. Due to the unique format of my training, and the ‘top out’ of LRs at 16 miles this training cycle, I waited to see if something terrible would happen after that…nope. Still felt strong! I took my third GU at mile 18. This is another place I was worried about. It was the turn around area right beforehand and my darn iPod was FREAKING out. It was skipping songs sporadically after a few seconds, then totally shut off. I pulled to the side to fix it, resulting in extra time in that split (8:50). At this point, I was feeling the effects of the wind on my sweat-soaked body and clothing, but I knew if I could just pull out a few more miles in the 8 min range, I’d be home free. The banked road was really getting to me, and that’s probably the main reason I didn’t like this half as much as the first. This is when the walls came crumbling down…literally. A wave of chills swept over me and I felt dizzy and faint. For safety, I pulled out my headphones and stuffed my iPod in my pocket. My legs felt incredibly heavy and each step was pained. Looking down at my watch, I saw my goal fading away, which was really hard at the time. It hurt so much. There were tons of amazing spectators cheering, but even that could not change my body’s disposition. I took out my phone and called hubs to let him know what was going on. I tried to hobble a little faster, but that was slower than my walk, so I waddled on. A nice runner came up next to me and asked if I was okay, I smiled and said I was glad we were almost done. He asked if I wanted to run it in with him and I thanked him, but said I was not able to do it at that point, but that I appreciated his kindness. He smiled and went on. When I approached the final circle area to the finish, the crowds were quite loud and made me smile, despite the throbbing in my legs. 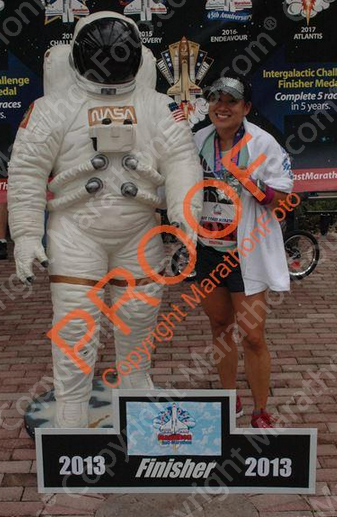 Nearing closer to clock, I saw Katie, Marcia, Joe and the Corral G crew, so I did my best to get through that finish!!! 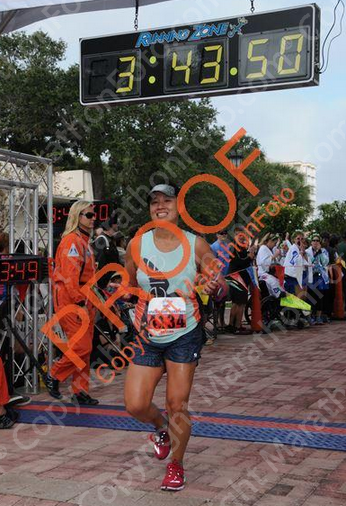 And though it wasn’t pretty by any means, I crossed the finish line of my 8th marathon, in pretty intense pain, but with a great sense of accomplishment. So, after I’ve had more time to process and plan my next course of action, I’ll be sure to share my thoughts on my training cycle (I will definitely be using it again, probably the Advanced Program next time, since I really enjoyed the Beginner’s one, and now I know my body can handle the mileage) but for the next two weeks, I am strictly following the orders of post-marathon recovery in my plan: TWO WEEKS OFF RUNNING! It’ll be different, after 18 weeks of 6-day a week training runs, but I know in the long run (pun!) it’ll help me regain strength, refocus and get ready for whatever’s ahead. I just wanted to thank every single person who sent a comment, tweet, or text today (and really, anytime in this entire training cycle) as it really meant so much for me to feel the love and support of friends, family and the greater running community. It’s hard to put yourself out there sometimes, especially when you don’t reach goals, but I never for once felt like what happened today let anyone down, or crushed me. Positivity pushed me toward the finish and it really can be attributed to the support of every single person who is reading this now. So, thank you. Words are not enough. So so sorry to hear the end was really painful, and I hope you are feeling better now. Congrats on going for it and feeling good about it even though the A goal wasn’t quite there. Marathons that don’t go well/have body issues are REALLY bad, I also have had 2 out of 3 so far teach me that. Way to be tough, lady! Thanks, Laurel!! I agree, choosing your attitude makes all the difference. I spent many years feeling negative and when i realized that only we have the power to adjust our reaction to things, it was a major breaking point. I still have my challenges (which usually are from road rage! hahah!!!!) but the mind truly is a powerful thing. I can be content because I know my mind never gave up. Krissy you have shown great courage in the way you handled what has to be a huge disappointment. Everyone you know can be inspired by your positive outlook post race. You will get that BQ someday and it will be a very sweet day. In the meantime, know that many of us appreciate watching your journey. So bummed for you that you totally went for it and got thisclose. But kudos for finishing with a well-earned smile! Do you think there was any one thing in particular that contributed to that hard wall? Charly – thanks for the comment. I am certain the major culprit was how my body reacted to the weather conditions – it was 90 percent humidity, and that stretch between Mile 25 to the end had wind coming off the river that made me feel incredibly cold, which effectively shut down everything. I took Gatorade at every station except the ones where I took my GU, but the last stop, I took a Gatorade cup and it was filled with water…I don’t know if that contributed, but I know I was totally disappointed when it was water and not Gatorade, haha!! So proud of you, Krissy! You’ll get your BQ one day and this race will just make it THAAAAT much sweeter. What a nice guy to let you run with him at mile 25. I love runners. You did awesome girl! And race day can bring in so many unknowns! I’m glad, in essence, that you listened to your body to finish safely and not just pass out or hurt yourself – you INSPIRE ME! You still ran a great race, Krissy! I’m so proud of you! Even though you didn’t have the finish you wanted, it’s definitely clear that you are more than capable of that BQ time! Great job on hitting your B goal despite hitting the wall! Sounds like you had a great race with a really tough finish. Hitting the wall is so brutal and frustrating and maddening, especially when you’re so close. 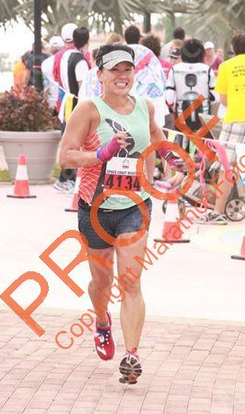 I LOVE that you’re smiling in those race pics. It shows what a great spirit you have! Enjoy your time off. I know you’ll get that BQ some time soon! I’m so proud of you, Krissy! I have no doubt that you’ll get your BQ one day very soon! There are a LOT of us cheering for you! I’m bummed that I didn’t get a chance to catch up with you and that I missed you on the course, maybe at another race soon! Ty – I think I forgot to add my last GU intake, Mile 23ish. Marathons are such a tough beast to conquer! You ran a really great race and have much to be proud of! I have NO doubt that you will get that BQ soon. Hugs! Congrats on toughing it out and pulling through when the conditions were not ideal! What an inspiration!! You are amazing Krissy! It’s been inspiring to follow you on this journey 🙂 Enjoy your two weeks off! Congrats! Awesome job and I am totally impressed with all the smiling photos!! Way to go. Enjoy your time off. You are an awesome runner! I know it didn’t turn out the way you wanted, but that time is still something to be so proud of. I think it is amazing. I know that one day soon, you will get that BQ. You inpsire me so much! You are an awesome person….to this day, even though we are cyber friends, it touches my heart that you offered to help me in my job search with a reference. I will never forget your kindness! Congrats on a well played race, no matter what! Hope you feel better soon! Gah! You are such a graceful and positive person! I can’t wait to run Boston to Big Sur 2015, yo. I can feel it! LOL! Limping that last mile felt anything but graceful 😉 Seriously though, thanks for dropping by to comment, <3. Those are some great paces! I hate when sh$% happens especially when you get so close to the end but you really fought hard for it so you should feel proud. I’m reminded of one of my own very painful disappointing race experiences…in high school, my coach swam me in one final meet before our champs meet to get me to qualify in another event. I swam two events and only ended up swimming one in finals to have the best chance of success. I missed the qualifying time by less than a second. It was heartbreaking. But the next season, I nailed the qualifying time early in the season. You’ll get that BQ girl. I believe in you! Kudos to you for your smiley, can-do attitude. You rock! Oh my gosh! What a crazy finish. Our bodies really do take over sometimes. I agree with you though, we’ll get it one day!